Welome to the Whisper Falls (Whisper Falls #1) Blog Tour! Today I am excited to be taking part and I'm really excited to welcome the author, Elizabeth Langston, for an interview! Let's Hear what she had to say! Most of my author friends knew from an early age that they wanted to write books. Not me. I’ve worked my whole adult career in the computer industry. Until I was into my thirties, the only thing I’d ever really written was software. Then my younger daughter started kindergarten, and I started my first manuscript. The finished story was bad, but I loved writing it. So I took lessons, wrote more manuscripts, and signed with an agent. After a dozen years of hard work, WHISPER FALLS sold. A WHISPER IN TIME (Book 2) took 7 months and WHISPERS FROM THE PAST (Book 3) took 4. With the sequels, I knew the characters and the setting very well. So they went much faster. I don’t think about themes in advance. When I start, I know the premise that kicks off the story. I know how it’s going to end. And I generally know the main characters (although they often surprise me as I go). Then I just write. It’s only after I’m done with the first draft that I look back to see what themes emerge. I have day job, so I have to write at nights and on the weekends. The only way it works is to have an amazing family. We eat microwave meals. My husband and older daughter run the errands. Younger daughter handles the laundry. And we’ve just had to lower our standards on how clean the house is. My day job and writing are priorities. Family is a priority. Everything else can just fall away. A painful problem, a flawed main character (MC) who needs to solve it, and a friend who cares enough about the MC to help. The first draft. The whole time I’m writing it, I want it to just be over with. I’ve written eight. Four have sold. I always love the one I’m working on. I’ve just wrapped up WHISPERS FROM THE PAST, so it’s my favorite right now. In the WHISPER FALLS trilogy—Mark’s grandfather, Charlie. He reminds me a lot of my grandfather, who was also named Charlie but I hadn’t noticed that until this moment. Wherever I am. I take my laptop with me everywhere. If I’m at home, I’m usually writing in a beat-up recliner in the bonus room with the TV providing background noise. I hope that librarians will want to recommend my books to their teen readers. Traditional publishing gives me the best chance with libraries and schools. My literary agent has done a great job of helping me realize that goal. My husband and older daughter never read fiction. Neither of them has read any of my novels. My younger daughter reads everything I write, multiple times. She is my copy-editor (and she’s very good.) She says that WHISPERS FROM THE PAST is my “best quality book”, but that WHISPER FALLS is still her favorite. Write all the time. Everything counts. Blog posts. Emails. Journal entries. It builds up “muscle memory.” If you’ve practiced hard, once you start to write stories, your voice will be second nature. My favorite author is Elizabeth George. She writes dark, smart mysteries with wonderful depth in her settings. The author who has most inspired me is Lois Lowry. The Giver was so different and unexpected. I read later that she had to battle her agent and publisher to get it published. Knowing that helped me to believe that it was okay to be different and unexpected. I have a freelance editor, Laura. She is a recent college graduate (BA in English) and is absolutely brilliant with fiction. She edits everything I write. When I’m planning a book, I hold brainstorming sessions with her. When I get stuck, she gets a call. Every writer should be so lucky to have a Laura. I have a fourth book releasing from Spencer Hill in November 2014. I began first round revisions on I WISH this weekend! Thanks so much for stopping by Elizabeth! So great to have you here! Good luck with the release and with your future books! Hello, I'm Elizabeth Langston, and I write fiction for young adults. 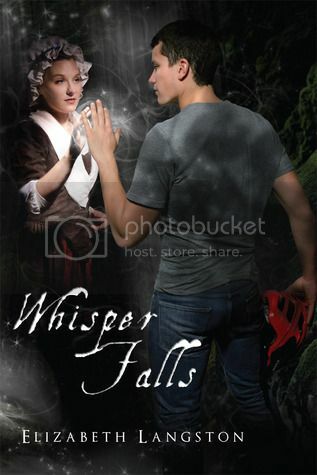 My debut novel, Whisper Falls (Whisper Falls, #1), releases November 19, 2013.